Tickets: $7 in advance/$9 at the door. Buy tickets here. November 30th marks the 15 year anniversary of the 1999 WTO protests, in Seattle. 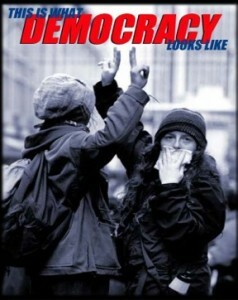 Come celebrate with us at Central Cinema, where we’ll screen the documentary This is What Democracy Looks Like, the most important documentary made about the protests. You can also enjoy food & drink, and peruse Community Alliance for Global Justice’s Fair Trade for the Holidays gifts. Filmmaker Jill Freidberg will be in attendance for a Q&A after the film, and several local activists interviewed in the film are invited to join as well, to discuss how the WTO protests shaped their organizing since then. About the film: Watch the trailer. Cut from the footage of over 100 media activists, This is What Democracy Looks Like captures the historic events of the 1999 WTO protests in Seattle. The film marks a turning point in collaborative filmmaking and achieves a scope and vision possible only through the lenses of over 100 cameras. With a driving soundtrack by Rage Against the Machine, DJ Shadow, and Anne Feeney, This is What Democracy Looks Like, delivers an intensely political and emotional account of a week that changed the world. The film is a co-production between Corrugated Filmsfounder, Jill Freidberg, and Big Noise Films founder, Rick Rowley. Photo credit to Rick Dahms. Co-sponsored by the Washington Fair Trade Coalition. For more information contact: Danielle@cagj.org.